If you’re looking for ways to make money online, affiliate marketing is a good option. Study reveals that Affiliate programs repeatedly top income reports for high-earning bloggers. You can also become one of such bloggers. Affiliate marketing is all about promoting someone else’s product or service in return for a commission on any sales. Your job (as an affiliate marketer) is to attract visitors to your predetermined location (a website), earn their trust, then you can easily promote your affiliate products. In affiliate marketing, when a user visits a publisher’s website (your website) and clicks an advertiser’s creative ad, the visitor’s browser receives a tracking cookie that identifies the publisher (you) as the marketer and tracks whatever sales that accrue from your work for calculating your total commission amount. 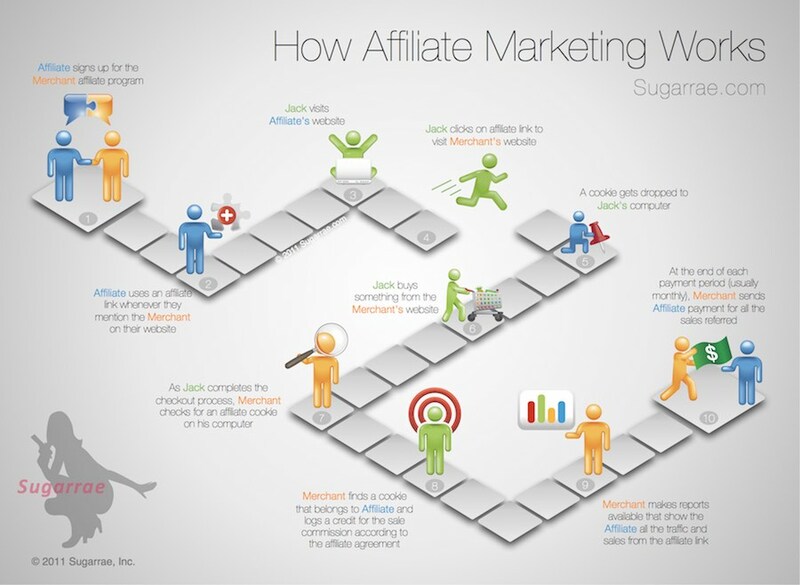 So how do you get started with affiliate marketing? 1) Blog/Website: In order to work as an affiliate marketer, you’ll need your own platform (a personal website or blog) on which to post links and advertise for your chosen products or services. If you don’t have the skills to build yourself a top-notch site or design compelling graphics, invest in a quality designer and copywriter to help you get your project off the ground. They’ll be able to help you set up your business for successful conversion. After all, if you’re going to put the time into starting a new venture, don’t you want to succeed? 2) An area of specialization: The key to finding success with affiliate programs is to build a content-rich website with useful information centered around a specific topic or theme. Don’t just throw random ads with no clear sense of purpose. Choose an area of interest and push for sales around that product/products. Your niche doesn’t necessarily need to be an area you’re already an expert in. You can also choose a specialized area, which you’re enthusiastic or interested in learning more about. 3) God writing skills: The best way to build credibility & trust is to write about something you know a lot about. This implies that you need a good grasp of whatever language you will be employing. You don’t need to be a professor, just a good content marketer. And remember, do more of helping rather than selling. Related article: How To Get More Customers In Nigeria Using Content Marketing. 4) Join an affiliate program: Don’t make the mistake of joining any and every affiliate program. Choose your affiliate programs wisely and don’t overload yourself. Find successful affiliates online, either through forums, mutual contacts, or affiliate networks and apply. Find a natural fit. If you sell a product that is out of line with and doesn’t have a natural appeal to your audience, your readers will be repelled by the idea that they’re being sold to. If you can’t find a way to make a product fit into your content strategy naturally – and you feel deeply that you want to promote it – consider trying a different platform, like Pinterest or email marketing specifically devoted to people in that target market. 5) Targeted traffic: Once you’ve built a popular platform and secured affiliates to work with, you’ll need to drive traffic to your affiliate program. This is probably the most challenging and tricky aspect of your work. Figure this out, and you can earn as much as you desire. A little knowledge of search engine optimization for your posts and social media can help to break this barrier. In conclusion, affiliate marketing is a lot of work, and in most situations there’s a lot of competition so you’re not going to be bringing in money immediately. Business owners and entrepreneurs suppose that all you need to do is setup a site and choose an affiliate to associate with and then just let it run its course. That isn’t true. Affiliate marketing takes time and effort to build and make money. Join The TrustOrRun Community To Get More Updates & Build Your Business.